For some people, the perfect night involves getting all dressed up and then going out to a party. For me, a perfect night involves comfy clothes and watching Netflix or reading a good book. Oh, the exciting life of an introvert! I have always loved watching movies and reading. There’s something appealing about escaping reality for a few hours. When it comes to movies, I typically watch comedies or dramas. I don’t even like to watch the trailers for scary movies. And I’m not ashamed to admit that I enjoy many “kids” movies too, especially those made by Pixar. To this day, I still think Toy Story and Finding Nemo are incredible movies. Even though I enjoy watching movies from the comfort of my home, I also love going to the movie theater. Let’s face it, my small TV can’t compete with the BIG screen and surround sound at the theaters. I remember going to see Guardians of the Galaxy when it was released. I settled in for a few hours of comedy and action, but within the first few minutes I had tears in my eyes. Why? Because in the opening scene the main character loses his mother. For those of you who have experienced any type of loss, you know what it feels like to be “triggered” – to see or experience something that takes you right back to the memories of someone you loved. That’s what happened to me sitting there in the movie theater. Instead of focusing on the movie, all I could think about was my mom’s final days in the hospital before she passed away. I’m surprised how many movies have themes of mother loss. I joked with a friend that just like movies are rated G, PG, PG-13, or R, that they should also have a rating of “ML” if the movie contains themes of mother loss. At least then we would be able to mentally prepare ourselves (and plan on bringing tissues with us). For those of you still reading, a few minutes into the movie I sensed an undertone of sadness. The camera lingered on a mother staring at their family Christmas tree. I knew right away something was wrong. Later on, we find out that the mother has terminal breast cancer and this would probably be her last Christmas with her family. This movie triggers me every time I watch it, because my mom battled breast cancer for 9 years. For 9 years, each holiday brought a mix of joy (that we still had time together) and sadness (wondering if it would be the last holiday with her). I treasured every picture, not knowing if it would be the last one I had of her. I kept every card my mom gave me, wondering if it would be the last time I would see her handwriting. After my mom passed away, that first year of holidays was so tough. One of my friends, Christine Fishel, recently wrote about why it’s hard for so many people to go home for the holidays. I told her that for me, going home means going back to a house full of wonderful memories of my mom. While sometimes that is comforting, other times it reminds me of how much I’ve lost. Now, it’s been almost 7 years since my mom passed away, but the holidays still bring a mix of joy and sadness. I have joy because I now focus more on the true reason for Christmas – the birth of Jesus. I have joy because I know my mom is with Him and we will be reunited one day. I have joy because instead of focusing on buying the “perfect gifts,” I focus on the fact that I have been given more time to spend with the people I love. Time is a valuable gift that is often taken for granted. I experience sadness because my mom is no longer here to share that time with me. Joy and sadness can co-exist. Navigating through the holiday season can be challenging. Traditions can be “triggers,” and we can soon find ourselves focusing so much on what we’ve lost that we miss out on blessings right in front of us. What can we do so that we don’t just “survive” the holidays, but actually experience some joy? Be kind to yourself – Do something that you enjoy and find relaxing. Look for ways to honor and remember your loved one(s). Share your favorite memories. Make new memories. Create new traditions. Surround yourself with others who love and support you. Skip the long lines at stores and going into debt – invest in the lives of those you still have time with. 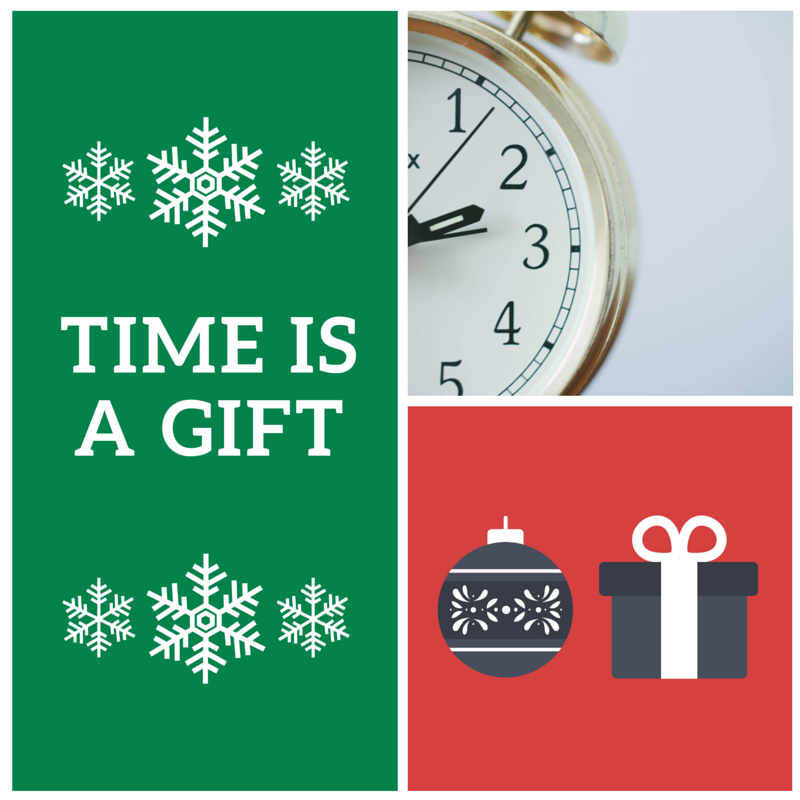 Your time is a gift. Who will you give it to this Christmas?